Interestingly enough, inhalable toxins can be detected in airways, just like they would be on the tongue. The airway response to detection is what’s most interesting. 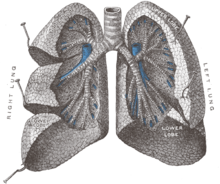 One school of thought is that logically, when bitter toxins are detected in the lungs, the airways will close. This prevents the toxin from entering the lungs, makes breathing difficult, and inevitably forces the individual to leave an unhealthy environment. What has been observed though, is quite the opposite. 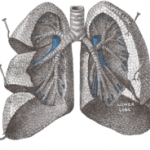 In mice, inhaled quinine (a bitter compound) caused the airways to relax, instead of constrict! In fact, quinine worked better than albuterol (a drug commonly used to treat asthma) at relaxing airways. There must be a benefit to having such a reaction. It has been proposed that opening airways may reduce the risk of infection or aid in clearing infection when toxins are inhaled, but it is still unclear. What is clear, is there will likely be new asthma medications developed in response to this interesting genetic trait! Print article This entry was posted by Amanda McBrien on November 11, 2010 at 3:40 pm, and is filed under DNA From The Beginning. Follow any responses to this post through RSS 2.0. You can skip to the end and leave a response. Pinging is currently not allowed.